If your child has asthma, you may have been shocked to hear that a flu shot—long recommended for kids with asthma—doesn’t seem to prevent flu-related hospitalizations. The findings were presented this week at the annual meeting of the American Thoracic Society in San Diego, Calif. But don’t skip the shot just yet, experts warn. THURSDAY, May 21, 2009 (Health.com) — If your child has asthma, you may have been shocked to hear that a flu shot—long recommended for kids with asthma—doesn't seem to prevent flu-related hospitalizations. The findings were presented this week at the annual meeting of the American Thoracic Society in San Diego. But don't use that as an excuse to skip the flu shot, experts warn. "Asthma is a risk factor for more serious flu and people who have asthma are more at risk for flu complications like pneumonia and hospitalizations, so if you can do anything to prevent the flu in that group, it’s important," says E. Neil Schachter, MD, medical director of respiratory care at Mount Sinai Medical Center in New York City. "If your child has asthma, the recommendations remain the same." The Centers for Disease Control and Prevention in Atlanta and the American Academy of Pediatrics both recommend the flu shot for all children over the age of 6 months. The National Asthma Education and Prevention Program says that children with asthma should get flu shots as well. "It is too early to do an about-face on something that makes sense to do, and has been proven safe and effective in many other studies," Dr. Schachter says. "The flu shot, although not 100% effective, is known to prevent the flu. Getting the flu shot, whether you are asthmatic, nonasthmatic, a child, or an adult, means you will be less likely to come down with the flu. This is based on bigger studies of wider numbers." In the new study, the researchers analyzed hospitalization rates among 263 children age 6 months to 18 years who had the flu between 1996 and 2006. Overall, children who had received the flu shot were three times more likely to be hospitalized than their counterparts who had not received the vaccine. What's more, children with asthma who received the vaccine (in this case, the trivalent inactivated vaccine given as a shot) were more likely to be hospitalized than their counterparts who did not receive the vaccine. The severity of the child's asthma, insurance issues, and other factors that can affect hospitalization didn't seem to explain the results. The researchers did not look at other types of flu vaccines, such as the nasal spray. "The flu shot did not have any protection against hospitalization in all children and also in the subset of children with asthma," says lead study author Avni Joshi, MD, a pediatrician at the Mayo Clinic in Rochester, Minn. Calling the findings "intriguing," Dr. Joshi says that the children who are most likely to be vaccinated are also those most at risk for landing in the hospital if they get the flu. Respiratory infections of any kind can aggravate asthma in children and adults, which can lead to breathing difficulties that require hospitalization. During the time of the study, flu shots weren't recommended for all children age 6 months to 18 years (that was a new recommendation for the 2008-'09 flu season.) At that time, only high-risk children—those most likely to end up in the hospital—would have been given a flu shot, which may partly explain the higher hospitalization risk seen in the study. The finding does suggest that flu shots are doing a less-than-perfect job at protecting children, particularly those who are at the most risk, says Dr. Joshi. Dr. Joshi, however, is not telling parents of children with asthma to skip the shot; in fact, quite the opposite. "The flu shot is very safe. The efficacy has been shown in previous studies about preventing influenza," she says. "Our study was a specific focus on influenza-related hospitalization, which showed no benefit. But this does not mean that the shot is no good. The shot is good, but we need to look at better options for preventing hospitalization." And she says that the study was relatively small and mostly included children who were sick in three different flu seasons—including one season when the flu vaccine was a poor match for the viruses circulating in the community. Greg Yapalater, MD, a New York City pediatrician in private practice, also urges caution in interpreting the findings of this study. "This is just one study that looked at one particular aspect—hospitalizations," he says. "There are other important questions, such as, 'Does the flu shot reduce sick days or the incidence of flu?' and the answers to these questions tend to be, 'Yes it does'." Don't jump to any conclusions based on one study, Dr. Yapalater says. 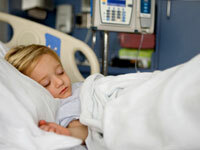 "Talk to your pediatrician and get his or her input on the best ways to prevent the flu and hospitalization." Harold J. Farber, MD, an associate professor of the pediatric pulmonary section at Baylor College of Medicine and Texas Children Hospital in Houston, and the author of Control Your Child's Asthma: A Breakthrough Program for the Treatment and Management of Childhood Asthma, also says flu shots do more good than harm in general, and particularly among children with asthma. "This is a very preliminary report that requires further investigation," he says. "This would not change my practice about using the influenza vaccine in children with asthma." That said, the flu shot is not the only way to prevent viral, asthma-related flare-ups. "Washing hands with soap and water and using antibacterial hand sanitizers will prevent more than just the flu," he says. "Also, cover your mouth and nose when you sneeze and cough." How You Can Reduce the Risk of Asthma Attacks.